BabyBoardy Blog: Thankyou Dr Lionel! You may remember that Kellie put us on to Dr Lionel Steinberg, after we SMSed her all the way from Dublin with the news that Naomi was carrying a little-un. Once we returned from overseas , we met with Dr Lionel every month, and then every fortnight and finally every week. He suited us to a tee - he was very 'matter of fact' and called a spade a spade. But he was also very kind, and happy to answer any questions. He was always very encouraging. 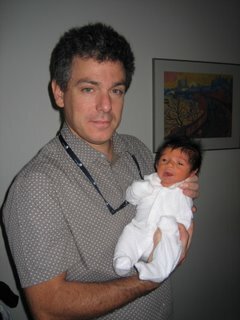 This picture was taken early on the morning when we left hospital, after he gave Naomi and Genevieve the all-clear. (The previous day we were asleep, so he told us he stuck his head in, but we didn't stir so he let us be). One of his main characteristics is his non-intervention stance. He is quite vocal in his opposition of the level of intervention these days. He believes there is far too much pressure on mothers, and therefore also on children today when it comes to childbirth. It is a natural process, when it can, it should be done as naturally as possible. Consequently, he was supportive of our decision to give HypnoBirthing a go, and was very happy that Nai was staying active, going to gym and doing the Fit-to-Deliver pilates. When the time came that Genevieve was coming out through the side entrance, he explained what was going to happen and the reason for it. Again, he didn't "pretty it up" - but just laid it bare the way it was. We always felt very calm, and very confident that everything was going to go well. So a BIG thanks to Dr Lionel, and Jane and all of the other staff at his offices at St Vincent's private. We heartily recommend him.